Good teams find a way to win even when not playing at the peak of their game. It’s fair to say that Aberdeen gave Celtic as stern a test last night as they’ve had all season in domestic competition. The fact they started to play once they had nothing to lose at 3-0 down hamstrung their chances of winning but fair play to the Dons as they had a go and played some good football. This Celtic side however is in relentless mood with a hunger and burning desire to win every match they play in. They now sit just two games from completing a league campaign without defeat and that is a remarkable achievement. Add to that the possibility of adding the Scottish cup to the SPFL title and league cup and it becomes clear that this could be a season which will go down in the history books as one of the best in the club’s long and illustrious history. Brendan Rodgers has bought well and augmented a decent squad with some very good players. Sinclair has been a revelation up front; full of movement, pace and goal threat. Patrick Roberts has been a nightmare for defenders to play against and Dembele must surely be the best piece of transfer business since Larsson was bought from Feyenoord for £600,000? Add to this the fact that many of the players who laboured under Ronny Deila last season are looking reborn and rejuvenated. McGregor, Armstrong and Brown have had a new lease of life and the Manager has used the squad wisely. He handles the media well and sees through the loaded questions and snares they set but above all he has got Celtic playing the sort of football the fans enjoy and which is again filling Celtic Park. 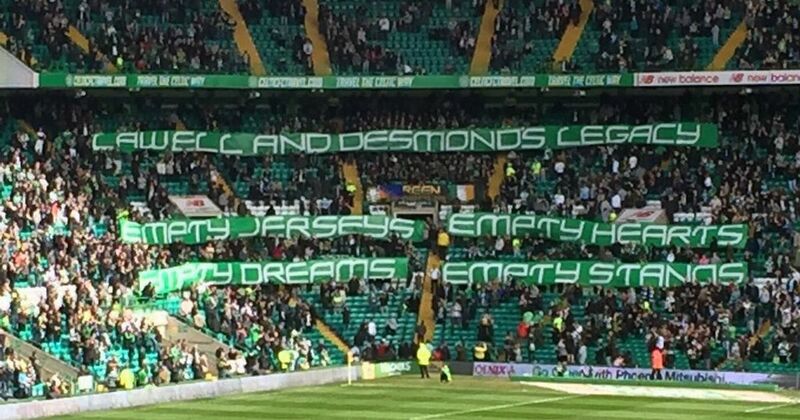 "Lawwell and Desmond's legacy: Empty jerseys, empty hearts, empty dreams, empty stands." "From boardroom to dressing room, you've embarrassed yourselves. The Celtic jersey has shrunk to fit inferior players." 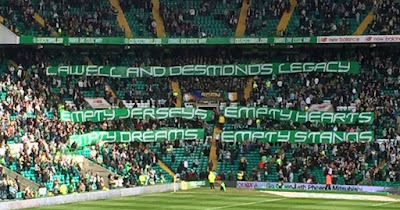 Whether you see such displays as unhelpful or necessary, it is clear that the general malaise around the club a year ago crystallised with that hapless performance against the Rangers in the cup semi-final which in honesty made a poor side look good. Dermot Desmond was said to have been unimpressed with the antics of the Rangers Directors that day and change was coming. That change came in the shape of Brendan Rodgers who has lifted Celtic and laid the foundations for a side which could go on to do remarkable things. Former Prime Minister, Harold Wilson, once said that ‘a week is a long time in politics.’ Well, a year is a long time in football and the changes this last twelve months have brought to Celtic have been a joy to watch. As the side march on demonstrating that ruthlessness which was sadly lacking at times last season, a few of us got to discussing which title wins brought us most satisfaction. For the older generation 1979 and the remarkable climax to a season which saw Celtic climb from third bottom of the table to win the title in that incredible 4-2 game against Rangers will take some beating. The 1986 miracle at Love Street was also regarded highly as it demonstrated again that Celtic fighting spirit and the benefits of never giving up until it’s over. The Centenary season took an honoured place too as it was a special season and Celtic produced the goods to mark it in style. 1998 and stopping the ten was a season full of emotion and nervous tension, while 2008 when the title was secured after a remarkable run of victories in the spring saw a seemingly lost cause end victoriously. The fact the Celtic family lost one of their most loved sons that spring added poignancy and genuine emotion to that title win. Now we stand on the brink of another piece of history as the class of 2017 have the opportunity to be remembered as the ‘Invincibles.’ That would earn them an honoured place in Celtic’s history. For me though, every title, every trophy is to be savoured. Not only because like many of you reading this I’ve stuck with Celtic through some tough times but because this remarkable football club means so much to me. 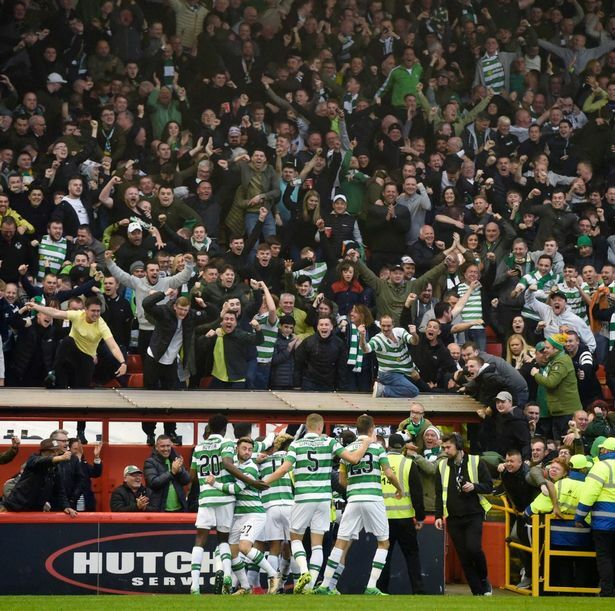 Didier Agathe once said after getting some flak from the stands, ‘They don’t shout because they don’t care, they do it because they care too much.’ For most Celtic supporters that is a truism. A club born into a poor and marginalised community gave it a sense of pride and a reason to smile in what were often hard lives. The supporters mirrored the club and left the ghetto to take their places in every sector of Scottish life. To see Celtic as the pre-eminent Scottish club is something we’re proud of still. Enjoy these days, a year is a long time in football and things can change fast. However with the Manager Celtic have now and the momentum the whole club has, it is likely Celtic will take some stopping for years to come. As for my favourite title win, that’s an easy one to answer........ all of them. Great read, as usual Pat. Last night we came out with all guns blazing. No Scottish team could have stood up to that. We have been a joy to watch this season. Stat analysis is amazing too, in terms of possession etc. Should be an interesting​ close season.